/ How To Keep Beer Cold On A Camping Trip! Whether you’re camping solo or with friends and family, one of the best times on a camping trip is when you can sit down, put your feet up, and pop open a cold one. But what if the cold one isn’t so cold anymore? How to keep beer cold, and remain a cool refreshing beverage, is the age old question, and one that Not Quite Wild want to help you solve! Warm beer is not the best thing on a camping trip, nor is it the worst (waking up to inches of water in your tent wins this), but it can be an annoyance. Here are some tips on how to keep beer cold, for longer, on camping trips, whether it's a musical festival, family getaway, or just an escape into the wild! 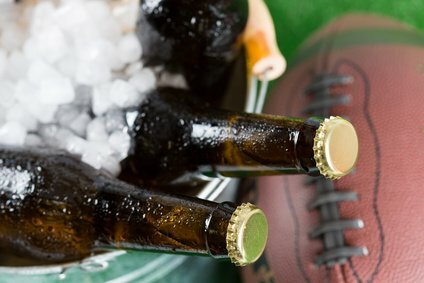 For the low budget method on how to keep your beer cold, we advise finding some dark, soft dirt under some thick shade, and burying your drinks in it for the day. The dirt should be soft and easy to dig into, and you should also make sure that this area won’t get much sun during the day. In a bush, or under some heavy foliage would be best. Leave the neck of the bottle exposed so you don’t get too much dirt when you get around to cracking the cold one open. Also remember where you’ve left the beer. You don’t want to be scrambling around the bushes when the sun goes down, trying to remember where you buried them! If you’re camping near a river, or stream, then you can utilise the flowing water to help cool down and keep your beer cold. Put your bottles of beer in a bag, and tie this to a rock or tree where the bag can reach the water. Submerge the bag, and let the water flow over the bottles over a period of time. It’s pretty much like running a bottle under a cold tap at home. Just make sure you tie the bag up securely, so the bottles don’t float away! If you’re super desperate, then you could always put a bottle in a wet sock or cloth and hang this up in the tree to try to keep beer cold. Apparently the combination of the wind and the wetness of the cloth cools the bottle down slightly. Think of a hot day when you’ve just had a shower and you stand in front of a fan. Whether this actually cools it down or whether the bottle just feels cooler to the touch, it’s definitely better than storing your beers in a stuffy backpack. One of the best methods on how to keep beer cold while camping is planning ahead! Make yourself a camping checklist, and make sure a good ice box cooler is on that list. Once the cooler is filled with ice, some of them are designed to insulate and keep things cool for days at a time, which means cold beers all the time!